To give it to you straight, DaimlerChrysler (DC) has two production vehicles now using a hybrid organic acid technology coolant (HOAT). This coolant’s inhibitor package is slightly different from traditional high-silicated green coolant, enough that it’s expected to provide double the service life, but is still compatible with traditional. 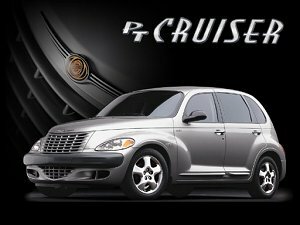 Above: The engine cooling system of DaimlerChrysler's innovative and successful PT Cruiser comes charged with the Zerex product, Glysantin G 05. In Europe, BASF has marketed coolants under the brand name Glysantin for several years. It has become synonymous with coolant. Background. Several years back, carmakers, feeling the push from new car buyers who like the words “low maintenance,” decided that 3-years and/or 30,000 miles was not a sufficient service life for coolant. The search began for a longer life product. In 1995, GM converted its new cars over to Dex-Cool®. That product, manufactured by Texaco, is a non-silicated organic acid technology (OAT) coolant designed to provide 5-year, 100,000-mile service (since upgraded to 5-year, 150K miles—but not for Saturn). Industry watchers expected that DC and Ford would soon jump on the OAT bandwagon. That didn’t happen. Instead, after running tests of their own, they decided to stay with what they had and research the options a little longer. To learn more of DC’s and Ford’s concerns about OAT, read “Coolant Controversy” and Technical Correspondent Paul Weissler’s “OE Makers Put Brakes On ‘Orange’ Coolants” as it appeared in the May 1999 issue of Automotive Cooling Journal. What’s a HOAT? Hybrid OAT in this case means it has a traditional Ethylene Glycol-base, with a single OAT inhibitor and is moderately silicated. The version now being installed by DC, and tested by Ford, is based on the German BASF product, Glysantin G 05. It has been used in extensively in European Mercedes Benz and other manufacturer’s vehicles since the late 1980’s. New users expect that it will provide the 5-year, 100K miles coverage they desire. G 05 proponents believe that its moderate dose of silicates provide greater aluminum protection than a straight OAT while still being water pump friendly. Why the secrecy? Why do I, an industry snoop and tradeshow gadfly, have to be the one to bring you this news? Why is it that the only printed material I could find about this “new” product (Glysantin at that)—written in English—was on a Latvian web site? (Latvia??) Could it be that none of the OEs really want to shine a light on their coolant products right now? Could there be a little consumer-based testing going on? Maybe. Editor’s Update: Valvoline has added a G 05 Technical Bulletin to their website. Starting at www.valvoline.com, select “Products” from the left-hand navigation bar; from the drop down options labeled “Choose Product Category,” select “Cooling System Products” at the bottom of the list; push the button labeled “Technical Bulletin.” Notice that different from Texaco’s DexCool, this product does contain from 252 to 308 PPM Silicon which Valvoline believes provides a better aluminum protection. ¤ Have a "goodoldpart" sitting on your shelf that may have value to the right car owner? Why not post it on www.goodoldparts.com?